Arora ... eye on growth. Jotun Powder Coatings Saudi Arabia has seen remarkable growth over the past year with its capacity having increased by 35 per cent following a complete upgrade of its main factory in Dammam. The expansion has included installing new production lines to cater to the ever-increasing demand from its customers. In addition, the company has also acquired another factory in Saudi Arabia’s Red Sea port city of Jeddah in order to provide solutions more efficiently to customers across the kingdom, according to Maneesh Arora, general manager. 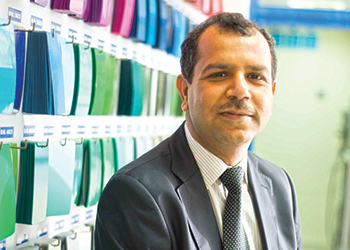 The paints and coatings specialist has been growing steadily in Saudi Arabia since its establishment over 20 years ago. Its annual capacity has been expanded almost fourfold to 15,000 tonnes, up from 4,000 tonnes when Jotun first arrived in the kingdom in 1995. Over the years, the company has built a sound reputation in the Saudi market. Its customer portfolio includes some of the biggest names in the architectural aluminium industry, industrial manufacturers of appliances, air-conditioners and other metal products, pipe fabricators for the oil, gas and water industries as well as manufacturers of coated steel reinforcement bars. “We believe in long-term commitments, which has always helped to strengthen our relationship with our customers and position ourselves as their trusted business partner,” Arora tells Gulf Construction. Jotun Powder Coatings (JPC), part of the Jotun Group, is a leading supplier of powder coatings used in industries related to appliances, furniture, building components, pipelines and general industries. “Our powder coatings are preferred for their ability to improve efficiency of customers’ application lines; for their aesthetic appeal combined with long-term durability; and for the reliability of products as well as technical service,” says Arora. In the architectural projects sector, JPC works very closely with consultants, façade designers, local and international architectural aluminium and glass system suppliers, contractors and coaters. Jotun’s qualified and experienced technicians regularly visit all application lines to support customers and guide them with the best practices to ensure quality application of its products. “We also regularly conduct our Jotun Powder School – a medium of communication highly appreciated by the industry for its depth and knowledge – to train technical staff in our customers’ plants on state-of-the-art knowledge and practice,” says Pednekar. • Jotun Super Durable, which combines aesthetics and functionality to allows clients to realise and implement the boldest ideas, according to Arora. Specially formulated to endure the test of time and the elements, Jotun Super Durable is well suited to withstand harsh levels of ultraviolet (UV) radiation, fluctuating levels of humidity, temperature variations and other severe weather conditions. It offers multiple colours, gloss levels and special effects so clients can choose the finish that best encompasses the essence of their design. • Cool Shades: This collection includes a range of heat-reflective architectural powder coatings that have been specially formulated to reduce the temperature of aluminium building components exposed to the sun. Using innovative technology, this range helps reduce energy consumption of the buildings and improve indoor comfort. The collection is suitable for window frames, curtain-walls, shutters, louvres, wall panels and other building components, and can be supplied in a wide range of colours to match the clients’ vision. • Aurora: This collection provides a rich organic and luxurious finesse to modern-day structures. By hiding die lines and substrate imperfections, it ensures high-quality and consistent finishing. Moreover, thanks to the excellent chemical resistance of powder compared to alternative technologies, the coated structures are easier to clean and maintain, cutting down on the need for repair and rework, and extending their life-cycle. Jotun has been active in introducing many innovative solutions to customers based on specific industry needs, and has always aspired to improve productivity and performance. “We work closely with consultants and architects to offer specific products that meet their project requirements,” says Essam Aridi, specifications manager, JPC. Citing an example, he says: “While Guard Miles+ improves the efficiency of the client’s application line, Guard Endure+ improves efficiency and reduces the rejection rate of furniture manufacturers. Arora says Saudi Arabia remains one of the largest construction markets in the region with high potential. JPC Saudi Arabia, which has been involved in prestigious projects in the kingdom including Princess Nora University, King Saud University, Gosi Business Park and King Fahad Medical Hospital, now continues to see its products utilised on a string of landmark developments. The company is currently supplying to projects such as Golden Towers, Al Waseel Hills, Sofitel Hotel – all supplied with the Super Durable coating – and King Abdulaziz International Airport in Jeddah. The Jotun Group is a matrix organisation divided into seven regions responsible for the sale of decorative paints and performance coatings (marine, protective and powder coatings). The company has 37 production facilities in 21 countries, 63 companies in 45 countries and is represented in more than 100 countries around the world. “Jotun focuses on the fundamental aspects of running a good and healthy business – developing our people in line with our core values of loyalty, care, respect and boldness; maintaining good, long-term relationships with customers and government authorities; understanding customer needs and developing innovative solutions to meet them; and providing strong technical service to ensure that the customer is fully satisfied with the experience of interacting with us and using our products. “We believe that these are the elements that lie at the roots of our success and which will enable us to meet the future with confidence,” Arora concludes.